Taco salad usually conjures up a vision of lettuce, tomato, cheese, olives, black beans, sweet corn and maybe some seasoned beef, chorizo sausage, chicken or pork. It's then topped with a dollop of sour cream and/or even guacamole with a nice dose of salsa to pull it all together. But this is not that kind of taco salad. It starts out similarly but what ties it together is the use of sweet bottled French dressing. What?! French dressing in a taco salad? Yes! Oddly, it's a combination that really works and you could even substitute it with bottled Catalina dressing too. For an additional crunch, Dorito chips (or any nacho flavored chips) are crunched and sprinkled on the top. This is a salad you'll have to try and taste for yourself because it really is delicious! In a large skillet, crumble ground beef and chorizo over medium high heat. Sprinkle all the seasonings over the mixture and saute until cooked through. In a large bowl, place the lettuce, tomato, beans, corn, cheese, salad dressing and seasoned ground beef and chorizo mixture. Toss to combine and place in a serving bowl. 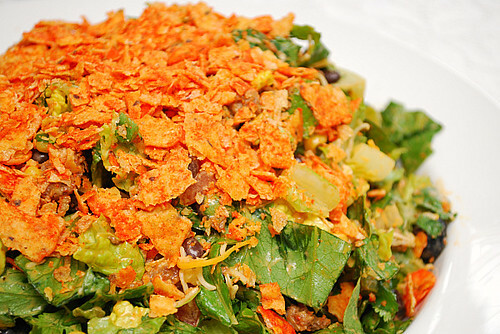 Sprinkle the top of the salad with crushed Dorito chips and serve. My mom used to make a recipe just like this! I had totally forgotten about it until now. My dad didn't like Doritos so she used Tostidos instead. Thanks for the jogging my memory, I'm going to have to try this soon! My friend's mom introduced me to taco salad made with french dressing and doritos! Love it!!!! looks like a good recipe, I will have to give it a try. I prefer my taco salad with Thousand Island dressing. 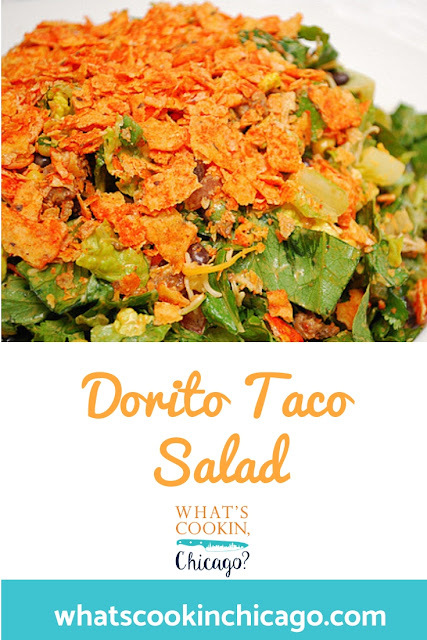 You dont want too much, but it adds a unique taste, and its the only way I like to eat my Dorito taco salads!